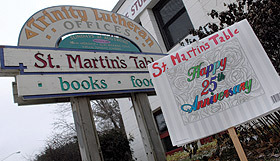 This week one of Augsburg's neighbors, St. Martin's Table, celebrates 25 years of serving the community. From the beginning, Augsburg faculty, staff, and students have been involved with "The Table," and it continues to be a favorite lunch and meeting spot for the campus community. St. Martin's Table was started in 1984 as the first visible outward ministry of the Community of St. Martin, a worship community that meets now in the Trinity Lutheran Congregation space at the corner of Riverside and 22nd Avenues. Garry Hesser, professor of sociology and director of Augsburg's Sabo Center, and his wife were original members of the Community of St. Martin. Hesser says, "No story should ever be written about their 25th without noting that it was Trinity that provided the space at well below market rate as it embraced St. Martin's mission and service to the West Bank." Tom Witt, another of the original members of Community of St. Martin, was also an Augsburg staff member for eight years in the Center for Global Education. Witt served on St. Martin's Support Group (board) for the first 11 years. "The Table was dreamed up to be a peace education center that represented the values of St. Martin and how people of faith work for peace and justice in their lives," he says. The St. Martin's Table restaurant serves organic, natural foods—tasty homemade soups, breads, spreads, and desserts—Monday through Friday for lunch. Volunteer servers donate their tips to support local and global hunger issues. Over the years, they have raised $660,000 for hunger organizations including Augsburg's Campus Kitchen program. "We always saw the proximity to Augsburg as being a plus," Witt adds. "And I think Augsburg has also seen this as a companion ministry to their work in the community." The connections to Augsburg are numerous: Students participate in service learning projects there. Norm Ferguson, a former sociology professor, volunteered every day at The Table as do many current faculty and staff members and their partners. Mary Laurel True of the Sabo Center formerly served on the Support Group, and Michelle Braley, a social work professor, currently serves. And, of course, many members of the Augsburg community visit St. Martin's Table daily to enjoy a healthy and delicious lunch. "Students get to know the community there," True says. "It's a wonderful place for our community to gather." Saturday, December 5 – Peace Pole dedication and performance by Caritas, an a cappella choral music group, 3 p.m.